All the world’s criminal justice systems need to undertake direct work with people who have come into their care or are under their supervision as a result of criminal offences. Typically, this is organised in penal and correctional services – in custody in prisons, or in the community supervised by services such as probation. Bringing together international experts, this book is the go-to source for students, researchers and practitioners in criminal justice, looking for a comprehensive and authoritative summary of available knowledge in the field. 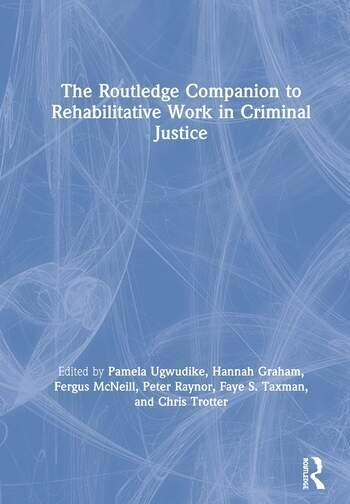 This book is an essential and flexible resource for researchers and practitioners alike and is an authoritative guide for students taking courses on working with offenders, criminal justice policy, probation, prisons, penology and community corrections. 4 Should there be a right to rehabilitation? 14 The Rehabilitative Prison: an oxymoron, or an opportunity to radically reform the way we do punishment? 75 Probation values in England and Wales: can they survive Transforming Rehabilitation? 89 Evaluating Group Programmes: A Question of Design? Hannah Graham is Senior Lecturer in Criminology in the Scottish Centre for Crime and Justice Research (SCCJR) in the Faculty of Social Sciences, University of Stirling. As a criminologist and social scientist, Hannah works with governments and parliaments, practitioners, citizens, communities and civic society to help inform real world change and collaboratively build more just societies. She has made contributions in Scottish, European and Australasian contexts. Also, Hannah is developing a growing research agenda on innovation and justice, which she has researched, written and spoken about in different countries. Her publications include Supporting Desistance and Recovery (2016); Innovative Justice (2015) and Working with Offenders: A Guide to Concepts and Practices (2010), all published internationally by Routledge. Fergus McNeill is Professor of Criminology & Social Work at the University of Glasgow where he works in the Scottish Centre for Crime and Justice Research. He has published extensively on institutions, cultures and practices of punishment -- and on how they might be best reformed in the light of evidence about desistance from crime. This work has led to a series of engagements with policy, practice and people with lived experience of punishment in numerous jurisdictions. Peter Raynor is Emeritus Research Professor of Criminology at Swansea University and has been carrying out and publishing research on criminal justice and offender management for more than forty years. Over two hundred publications include jointly edited collections on offender supervision (with McNeill and Trotter), compliance (with Ugwudike), social work with offenders (with McIvor) and race and probation (with Lewis, Smith and Wardak). He is a member of the Correctional Services Accreditation and Advisory Panel for England and Wales, and a fellow of the Academy of Social Sciences. Faye Taxman is University Professor in the Criminology, Law and Society Department and Director of the Center for Advancing Correctional Excellence at George Mason University. Her work covers the breadth of the correctional system from jails and prisons to community corrections and adult and juvenile offenders, including all types of interventions and system improvement factors. Dr. Taxman has published over 125 articles. She is the author (with Steve Belenkos) of Implementing Evidence-Based Community Corrections and Addiction Treatment (Springer, 2011). She is also on the Editorial Boards of the Journal of Experimental Criminology, Criminology and Public Policy, and Journal of Offender Rehabilitation. Chris Trotter is Professor in the Department of Social Work at Monash University in Australia. Prior to his appointment to Monash he worked for many years as a social worker and manager in child protection, juvenile justice and adult probation and parole. He has undertaken many research projects and published more that more than 50 articles and book chapters during the past decade. He is internationally recognised for his work on pro-social modeling, has assisted probation services around the world in the implementation of the programme and has provided advice and consultancy on effective practice in offender supervision. He has authored two books- Working with Involuntary Clients, now in its second edition and translated into German, Japanese and Chinese, and Helping Abused Children and their Families. Additionally, in 2011, Dr Trotter co-edited, with Fergus McNeill and Peter Raynor, the book Offender Supervision: New directions in theory, research, and practice.